All records from the Arenac County Clerk are available from 1883 to the present. Individuals can go to the genealogy department in the Clerk's office to do research, and only two researchers are allowed simultaneously due to space restrictions. Birth, death, marriage, and other records are all available, and copies are available for printing for $5 per initial copy, and $2 for following ones. Bordering Lake Huron, almost 50% of Arenac County is comprised of water. Part of the Michigan Islands National Wildlife Refuge, an area of eight islands in the Great Lakes, is located within the county. 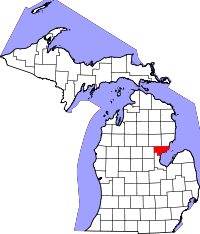 Arenac is relatively small, compared to some of the other, more highly industrial areas in Michigan, with around 17,000 residents according to the 2000 Census. The word Arenac is one of the many county names created by Henry Schoolcraft in the mid 1800s.